Want to connect with multiple people at any place and time? Pocket PC to Mobile Bulk SMS Software is designed and developed for those people who want to communicate through bulk SMS. Bulk text messaging program allows you to send group text messages from your pocket PC device. Now you have power to connect with different people, no matter where they are, with this pocket PC to Mobile bulk SMS software. → Send price alert, news alerts, reminders, invitations and personalized messages. → Communicate with your friends, relatives, customers and clients. → Promote your products, brands and services. → Expand business across the world and grow sales. → Regulate and control your business advertisement cost. 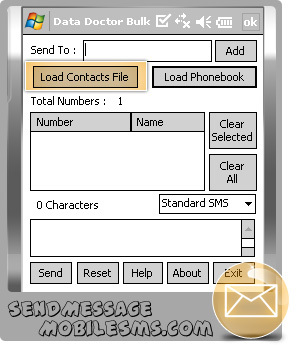 Pocket PC to Mobile bulk SMS software quickly sends multiple text messages from pocket PC device. Software provides inbuilt list wizard option to maintain the list of contacts or groups which may require during the message sending procedure. Pocket PC bulk SMS software easily works on entire Windows based pocket PC device.